Boy, it sure got hot fast. One night I had on the heater and then all of a sudden it’s 100 degrees every day. And my plants are wilting in the sun by noon. The time for planting here is over, I do think. Too hot now. Is anyone familiar with this bird? Not the mourning dove. The pic below that one. 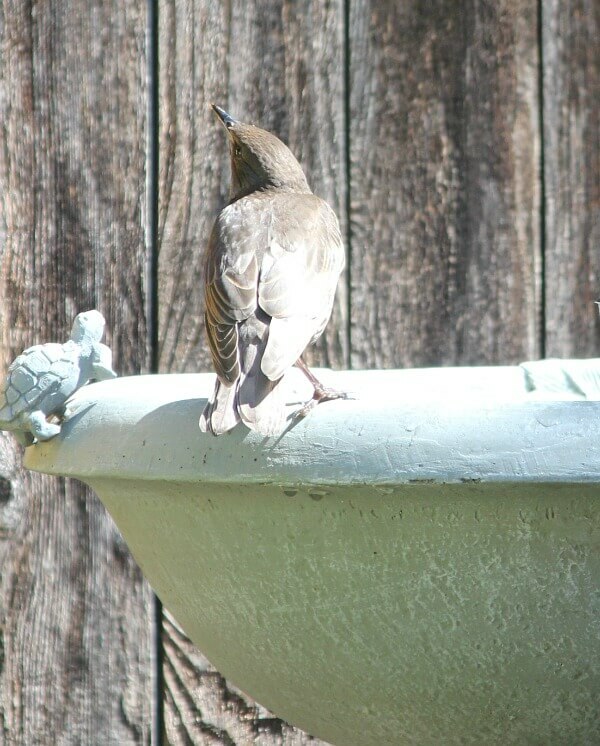 It does not like the sparrows and pecks at them while all are perched at the edge of the bird bath. 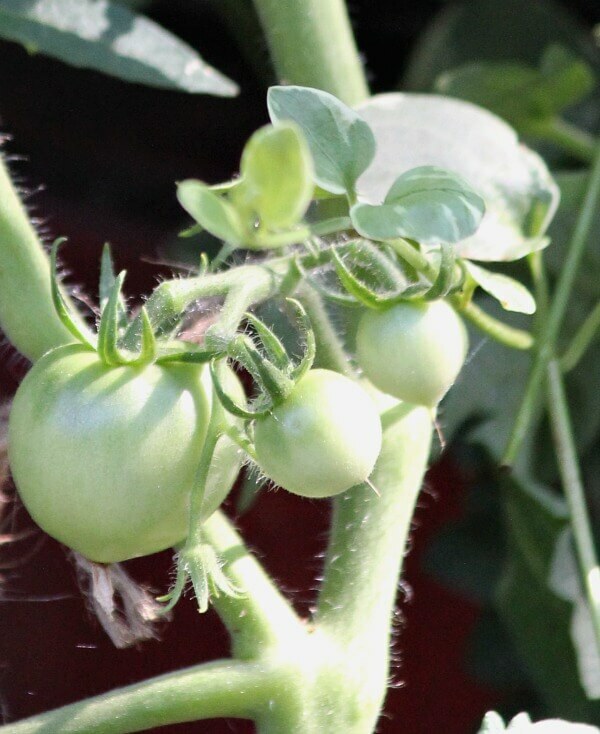 Can’t wait for ripe tomatoes. Did you plant tomatoes this year, or are you planning to? Do you have any tried and true tips for yielding great tomatoes? 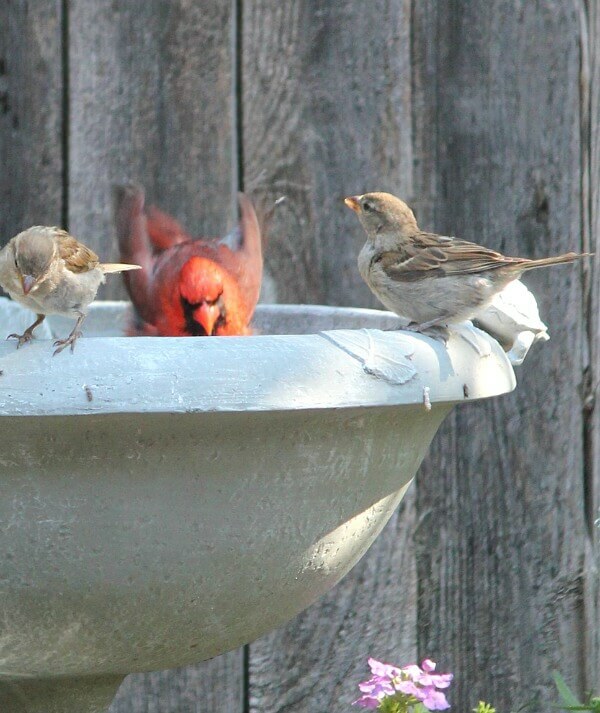 A male cardinal has his bath among the sparrows at the big bird bath. I’m sure the female is not far away. I watched while he preened and cleaned himself. He took quite a bit of time with his bath. This squirrel, or one of his cohorts, daily taunts Charlie Ross. He will see Charlie at the patio door, lock eyes with him, and begin his little song and dance. And it’s quite dramatic. 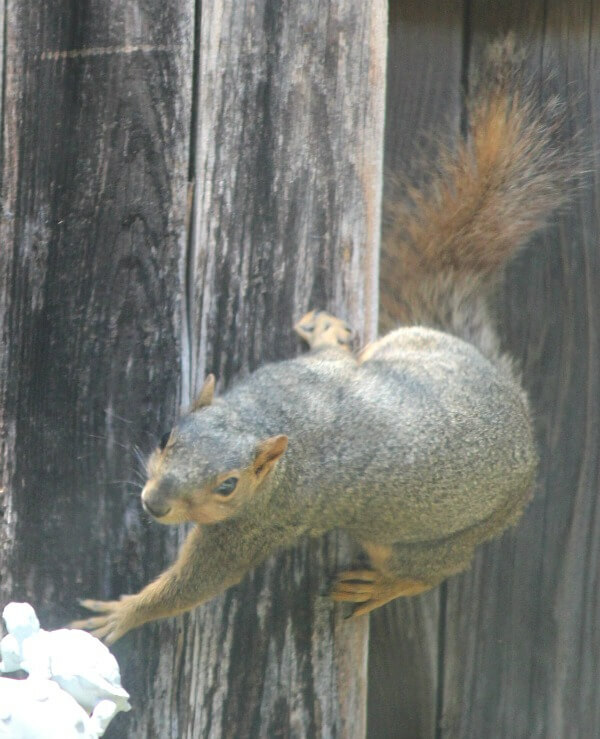 He will run along the fence, stopping every few feet to swish his bushy tail. While Charlie sits on his haunches, trembling with excitement. I cancelled my dentist’s appointment. I’m going to let my mouth stop hurting from the other day’s cleaning and then see if there are any dental schools around here. The dentist I go to is a woman and I really like her. She did agree to lower the price $650. But I still backed out. Going to check out all your suggestions. So I thank you for them! 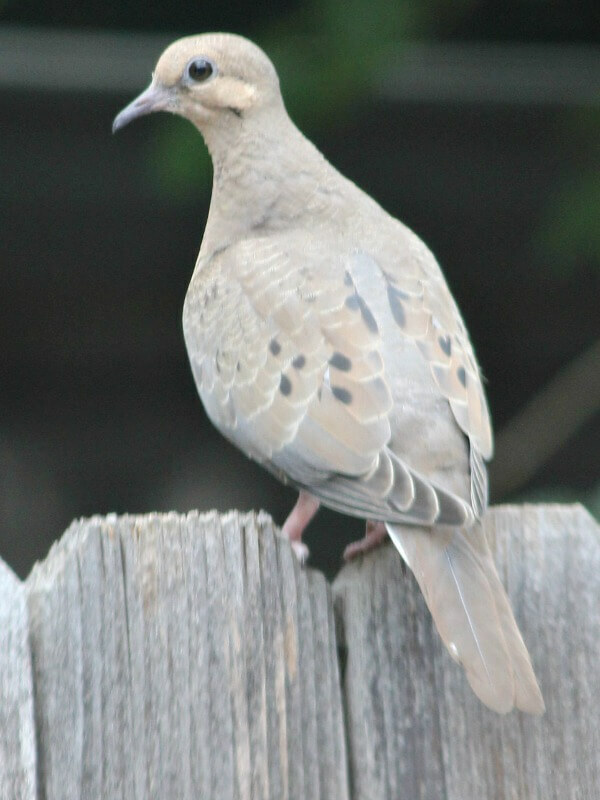 Looks like a Mourning dove to me. Birds and animals are such a joy to me. Looking forward to see who knows the name of the unfriendly bird. It seems like good fun for Charlie. We tried growing tomatoes a few years back but they didn't turn out so good, may have another go in the 'new' house. Fresh tomatoes are so much tastier than bought ones. I was going to say the same thing, it is a mourning dove. They make a pretty cooing sound. He/she has a mate close by too, they are birds that mate for life. You usually always see two together around here. Lots of great shots here, Brenda. 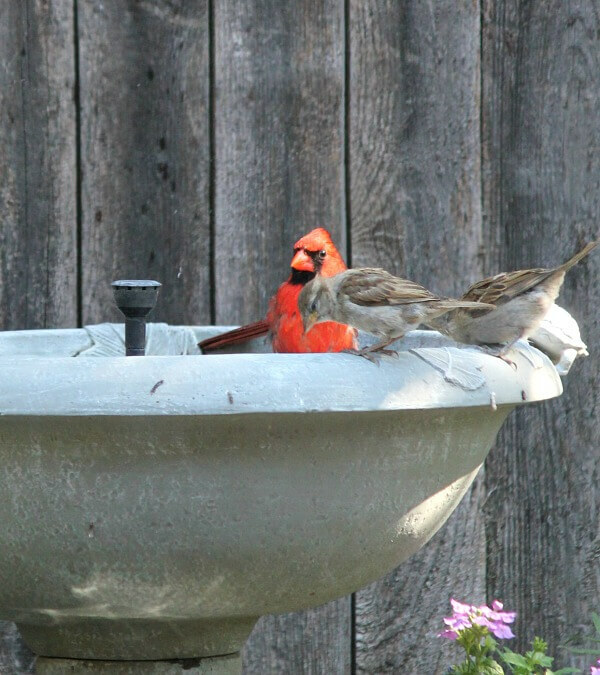 I too love to watch the birds in the birdbath …they enjoy it so. Could it be a mockingbird? That's what it looks like to me. I had one in my garden in NYC – funny enough I have yet to see one up in the mountains, perhaps they like the city better. I laughed right out loud at that photo of Charlie, the way he's ready to pounce!! Such a cutie pie! I'd need to see a picture of it from a side view to get a better look. I have a Mama Mourning Dove nesting in the tree right next to my porch and get to watch the family's antics as I sit outside. Take care of your teeth as quickly as possible Brenda, because pain means infection and you don't want it to spread. I've had to do 2 crowns last year and will be getting 2 more of them in about 2 weeks time. The root canals have already been done. I'd never had any trouble with my teeth until just the last two years (will be 61 in a couple of months). It's always been just cleanings and little filling and then "Bam! ", teeth have developed cracks and then bacteria gets in and down to the root it goes! Good luck! I'm lucky enough to have 100% dental coverage through my employer for almost all dental procedures. Restorative work like having a crown made for the tooth is only 60% covered (the root canal is 100% covered and a permanent filling). Since my husband also has dental insurance through his employer, it covers the 40% my doesn't. So lucky! Right now I'm on a medical leave since the first week of January because of foot surgery. 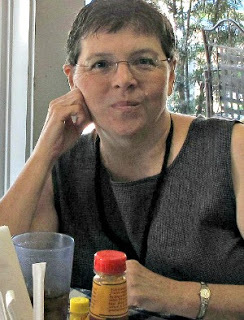 My employer provides 90% of my salary while I'm on Short Term Disability. I was off for 5 months last year because of surgery on the same foot and received the same benefits. I'm very lucky to have such good dental benefits and sick leave policy with my employer. I work for a large school board in Canada with 22,000 staff members so they can arrange for great benefits with insurance companies. Health care is free so that's another plus for me and all my other health issues. My only gripe for today is the weather system due to El Nina has given us a cool wet summer. My garden is NOT thriving. Just minutes ago I read about a guy who saved a squirrel that had been hit by a car. Since it didn't run or gnaw as usual during its recovery, he worried about its teeth and had a dentist neighbor make braces. For the squirrel! From what I can see, it looks to be what I was told is a Jenny Wren. They are slightly a rusty color. I have one that will build a nest in my hanging basket each year. The bird looks like an Aztec dove. The bird looks like a starling, and they can be aggressive. Love your patio and all of your flowers, so beautiful!! I feel your pain with the cost of dental work. I too had waited quite a while to see a dentist related to a bad experience I had. He failed to numb me enough and I could feel every thing and would nearly jump out of the chair each time he hit a nerve, which was several. He blamed me for being to0 tense and said I over reacted. I didn't go to any dentist for way too long after that. So, when I was forced to go (pain) I checked around for references. The new dentist was great, but I needed cleaning and 4 fillings. No caps, bill was over $3,000. A different kind of PAIN. Good Morning Brenda 🙂 It looks like a starling, and they can be a bully. 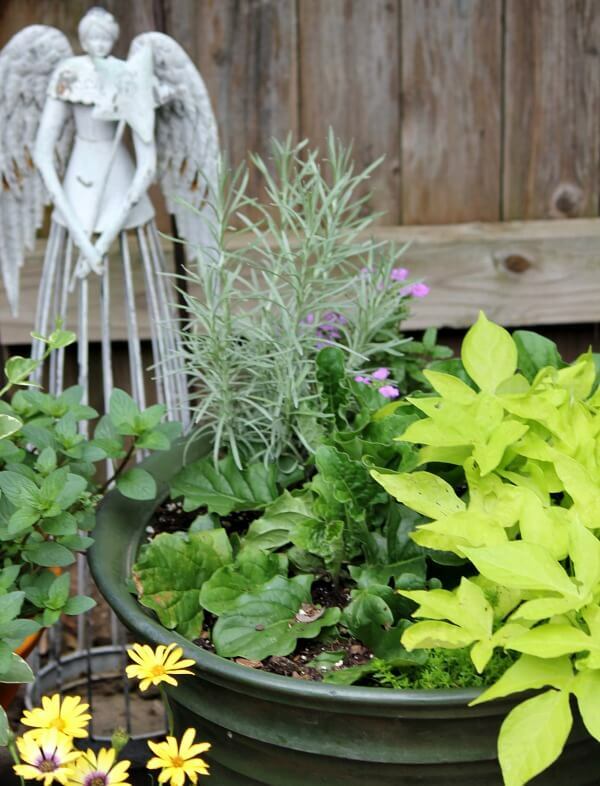 Love all of your containers of flowers and herbs, so peaceful and relaxing. 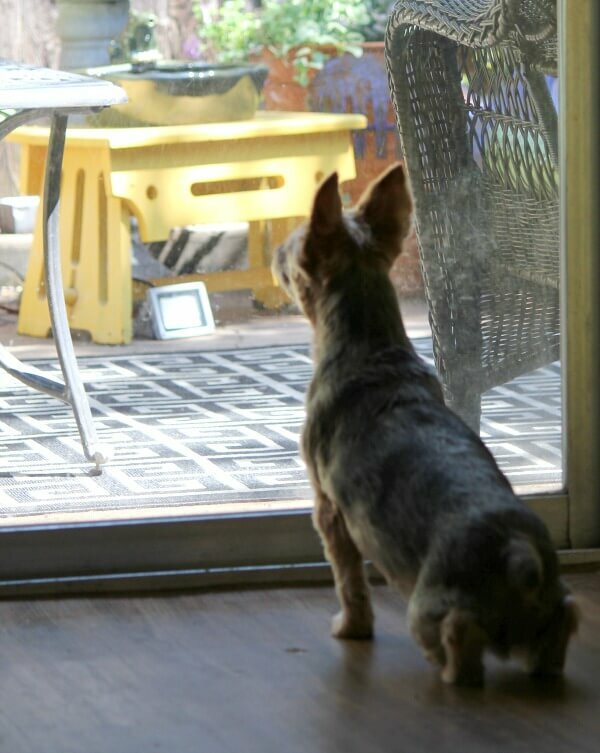 Poor Charlie, being tormented by the squirrel. Hope everything works out on your dental. Have a wonderful day! Since you like your dentist and are comfortable with her, you might ask her if she can do the work in stages. That might be easier on the budget. It was very good of her to give you some money off. Have you sat down with her and explained your whole financial situation? Some professionals can be wonderfully understanding and do what ever they can to help their patients stay healthy. I was thinking of the dental school thing last night. The noise and hubbub may not be the best for you. I think you are smart to let your mouth heal before starting something new. The dental school is an excellent idea and they do good work. Charlie and that squirrel each have something to look forward to each day; I'm sure if it was able, the squirrel would stick out his tongue at Charlie! The cardinal is beautiful; we don't have them here. On my screen it shows up as being brown. Could it be a cowbird? or maybe a starling. I sometimes see cowbirds grazing for bugs in the grass. Sometimes they are with the group of starlings. Charlie sure has fun squirrel watching, doesn't he. We have lots of wild squirrels living in the rocks near the pier, but I would be afraid if Lulu ever played with them.